Sunday, November 5, 2017. Hundreds were without power after 105 mile per hour winds came through the area. One day later, over 23,000 people were still without power in the Northeast Ohio area. 9,107 people in Twinsburg alone had reported outages from the storm. At least 5 electrical poles were damaged as well as multiple homes in the area. Like other cities at the time, Twinsburg finds itself amidst the beginning of the Civil War. Note: O.V.I. is the abbreviation for Ohio Volunteer Infantry. For further reading on Twinsburg’s soldiers during the Civil War, look for Beyond the Monument: The Civil War Soldiers of Twinsburg, Ohio written by Veronica Hughes, published in 2017. Ethan Alling left for Ohio with three hired men, Zeri Alling, Rodolphus (called Tom) Wolcott and Lex Johnson on March 3, 1817. A sawmill was built in 1817 and a gristmill was built in 1818. In 1818, a frame barn and part of a frame house were also built. Joel N. Thompson ran a distillery in 1821. Drivers stream onto East Aurora and Darrow roads from Exits 36 and 37 every day as the highway pumps business into the region and attracts renters and homebuyers to the once far-flung community. Prior to the construction of I-480, commuters had a much longer drive to and from the area. To negate or offset the cost, some would carpool and others would catch the trains to and from Twinsburg, destined for Cleveland and stops along the way. But Chrysler was an economic juggernaut, attracting new residents and bringing an influx of tax-based income to the region. The introduction of the highway in the 1960s made the three communities more accessible and appealing. Originally known as I-80 before becoming part of I-480 in the 1970s, it opened a world of opportunities for builders and buyers, businesses and customers. It was almost an entire century after its inception before Twinsburg had its first bank. In 1911, E. O. Cristy made it widely known that he intended to open a bank, but few took his claim seriously. Sadly, he was not able to see his dream realized, as the bank he had worked to create opened a few months after his death. Cristy’s grit and determination paid off posthumously when the Twinsburg Banking Company finally opened on November 11, 1912, with C. E. Riley acting as president. The first customer was A. J. 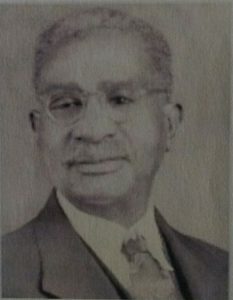 Brown, who stood patiently at the front door awaiting the initial opening of the bank in hopes he would have the honor of opening the first account for his grandson, J. C. Leland Brown. The early years were difficult for Twinsburg’s fledgling bank. Sparse growth was a major concern. Adding to the instability of the bank, cashiers came and went at an accelerated pace. By the beginning of 1931, it was uncertain how much longer the Banking Company could remain in operation if business didn’t improve considerably. In March of that year a young banker named Lester W. Roxbury was hired as cashier. The hiring of Mr. Roxbury proved to be the elixir the ailing bank desperately needed. The young firebrand fearlessly forged a brave new path for the financial institution. No task was too small or great for Mr. Roxbury to perform if it would save the bank a dollar or add a dollar to its coffers. In just four years, under the helm of Roxbury, the bank’s resources grew from $241,000 to $350,000. Growth and prosperity continued, and in early 1946 the Twinsburg Banking Company, which by this time had been dubbed “the biggest little bank in Ohio,” broke ground for construction of a large addition and a complete remodeling of their building. Resources had to climbed to the once inconceivable sum of $3,596,000. By the late 1950s the bank outgrew its original structure and a more modern building was constructed, featuring fourteen teller windows, a new safe-deposit vault, an employee lounge, and air conditioning. Prosperity is not eternal, however, especially for the little man, or in this case the little bank. The rise of corporate banks rendered small banks such as the Twinsburg Banking Company nearly obsolete. On December 31, 1984, the Twinsburg Banking Company merged with First Merit Bank of Akron, signaling the end of little banks in Twinsburg. Although he was born and came to prominence prior to the centennial celebrations in 1917, much of his life’s work was carried out afterward, well into the twentieth century. From the dawn of the twentieth century up until his passing in 1956, Dr. Chamberlin aided townsfolk and friends with whatever ailed them. During more than fifty years practicing medicine, he gave tirelessly of his time, participating in a number of area organizations. In 1915, the doctor served as president of the Library Board. After many years filled with many long days, Dr. R. B. Chamberlin passed away on April 24, 1956. In honor and recognition of his dedication, the new high school was named for him the year following his death. At a cost of $71 million, the Cleveland Clinic opened the 190,000-square-foot Twinsburg Family Health & Surgery Center in June of 2011. Located off Darrow Road, just a short jaunt from I-480, the glistening new edifice brought the Cleveland Clinic, employer of the masses, to the people of Twinsburg. The Clinic, known to employ more workers than any other entity in the state, was slated to bring approximately three hundred jobs to the area when the new campus opened. The Township’s story began in 1817, a mere blink of the eye after the arrival of Ohio’s first settlers. Ethan Alling, then a young man of sixteen, came to Ohio to survey family-owned land in what was then known as Millsville. Though he held countless positions in and around town over the years and his contributions to the area are indisputable, it was the Wilcox twins, Moses and Aaron, who would eventually bestow upon Twinsburg its current moniker. Arriving six years later, these young entrepreneurs purchased an expansive swath of land and began selling off parcels, contributed to the creation of a school, and eventually donated a small plot of land for the creation of a town square. Much of the history to come would radiate outward from this point: Twinsburg Institute, Locust Grove Cemetery, family-owned businesses, farms, schoolhouses, and churches sprang up within view of the square. The streets lining the square were always the center of festivities. Richner Hardware, Lawson’s, and Roseberry’s appeared, providing big-city amenities with the comfort of small-town familiarity. During the 1920s, a man named Charles Brady saw a need to give African Americans an opportunity to purchase land in the area to form a community of their own. The newly purchased homesteads, known as Brady Homes, formed the foundation of what would become Twinsburg Heights, a tightly knit community in close proximity to the eventual site of the Chrysler stamping plant. Something strange happened following the creation of these three communities, though: talks were held and attempts were made to recombine them, some as early as the 1960s. Former Twinsburg mayor Katherine Procop outlined some of the discussion: “There were three [major] attempts, one in the ‘80s and two in the ‘90s, to merge the township and the city. The first two attempts were voted for by city residents but voted down by township residents. The third attempt in 1999 was finally voted for by the township residents but voted down by city residents.” Following this last attempt, the Township attempted to forge its own way, negating any future potential for reconciliation. By establishing the Joint Economic Development District with Reminderville, Twinsburg Township increased its economic stability and lessened the likelihood of future annexation talks with Twinsburg. The Twinsburg Township-Village of Reminderville Joint Economic Development District (JEDD) is a separate political subdivision, established in 2002 . . . per a contract between the Township and Village. The JEDD levies a 1.5% tax on employee wages and business net profits in the JEDD area, which includes all land in the Township’s industrial district. The JEDD’s primary purpose, as stipulated in the JEDD Contract and as directed by the JEDD Board, is to promote jobs and economic development in the JEDD area. The JEDD Board takes this mission seriously and, in the years since establishment of the JEDD, has overseen significant investments in the JEDD area. JEDD area investments included reconstructing and adding sidewalks and decorative street lighting to all Township roads in the JEDD area, increasing police protection for JEDD area businesses, establishing a park in walkable distance to JEDD area businesses, enhancing public transit accessibility through the addition of METRO RTA bus passenger shelters throughout the JEDD area, and clearing snow from sidewalks and bus passenger shelters throughout the JEDD area during the winter season. With the JEDD in place and community services secured for its residents, the Township has cleared the way for a bright and independent future. The Township began its Recreation Center Program in 2008, granting its residents access to nearby recreation centers, and its police, fire, and EMS services are outsourced to Twinsburg. Through the decisions and directives firmly in place, Twinsburg Township has managed to merge the best of both city and country. Page 16 “and its police, fire, and EMS services are outsourced to Twinsburg.” Police services for the Township are provided by the Summit County Sheriff’s Office. Page 38 Bowen’s Garage, Twinsburg’s first fire station, on the southeast corner of 82 and 91 from 1929 to 1939. Page 42 The Township Police Department was disbanded in 1998. Demetrius R. Maccannon is the correct spelling of the sergeant’s name. Page 45 Betty Tomko’s tenure with the Fire Dept. was five years. Page 88 “the organization has steadily grown and now boasts 265 members. Page 88-As of 3/14/2017, there are approximately 450 businesses in the three communities. Ripley’s Believe It or Not!, first published in 1923, is as an iconic part of newspaper comics as perhaps any strip which has ever been published. 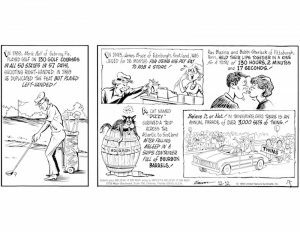 Over the years Ripley’s has grown to more than 100,000 cartoon panels with a peak readership of 80 million people a day. Why does this matter to Twinsburg? Because our small region has appeared in a Ripley’s panel on three separate occasions. The first was published on December 26, 1962. 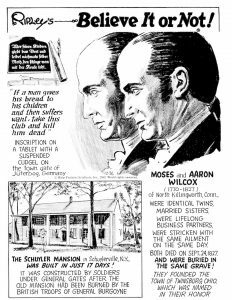 It featured Moses and Aaron Wilcox, not just because they were Twinsburg first twins, but because of how similar their lives were. Many people remember this particular cartoon panel plastered on the walls of Twinsburg’s classrooms in the 1960s. The second, published on December 12, 1993, celebrated the Twins Day Parade and the over 3,000 sets of twins who register for the event. 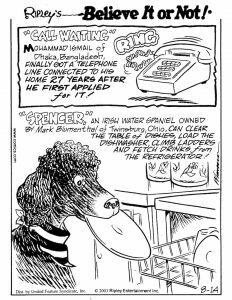 Finally, on August 14, 2003, Ripley’s told the tale of Mark Blumenthal’s Irish Water Spaniel Spencer. It seems Blumenthal had trained Spencer to clear the table, load the dishwasher, climb ladders and fetch drinks from the refrigerator. A lot of parents were probably jealous of Blumenthal. Ripley’s celebrates some of the most unique aspects of America, and because of that it makes perfect sense Twinsburg has appeared in Believe It or Not! more often than areas easily twice its size. Just another reason for our region to be proud of its history. Mount Olive Baptist Missionary Church has enthusiastically been serving the spiritual needs of the Twinsburg Heights community for over 85 years. Within the three communities only the Twinsburg Congregational Church has a longer continuous history. 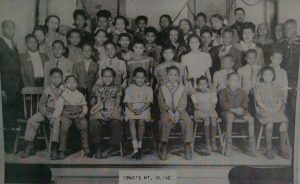 Not long after the Heights was established as an African American community within Twinsburg, a small group of residents met to form what would eventually become Mount Olive Baptist Church. The small group, meeting in the home of John and Emma Mckinney, first organized themselves on May 25, 1932. The group included the Mckinneys, Hiram and Betty Studevant, Louise and Blanch McDonald, acting secretary Christine Golden and Rev. Wilder, who served as the initial chairman. The congregation held their services in the Mckinney’s home until April 16. 1933 when they relocated to The Church of God in Christ on Eaton Street, where they continued to meet for the next year. In 1933 though, Charles Brady of the Ravenna Building Co and the developer of Twinsburg Heights, had promised a church to the first minister who purchased a home in the development. Rev. John Ribbins, previously of Cleveland, purchased a home in early 1934 and was awarded a lot on the current church site at the corner of Oxford and Yale. Ribbins’ house, after several remodels, still stands. Pastor Ribbins capitalized on the standing offer from Charles Brady of the Ravenna Building Company to provide land for a church to the first minister to purchase a house in the Heights. The men of the community dug and built a basement for the church, volunteering their free labor during the W.P.A. era. On the fourth Sunday in April of 1934, the congregation marched from The Church of God in Christ to the new church and held services their for the first time. The church consisted only of a basement, which would be the congregation’s home for the next three years. And while it has continued to grow over the years, both spiritually and physically, The Church of God in Christ structure no longer exists. In the spring of 1937 the membership started work on the framework for what was to become the upper sanctuary. It was completed by that winter. In the subsequent years a pulpit area and a choir loft were also added. In 1970 though a major renovation occurred when a front room, church office, choir room, restrooms and a pastor’s study were added. Mt. Olive, currently led my the Rev. Wallace Thomas, continues to serve the Twinsburg Heights community. The Heights has always been well served by its churches, with six congregations currently residing within the community, but Mt. Olive is the originator. For more information, check out Mt. Olive’s website. The Twinsburg Ledges, possibly the most beautiful and beloved local natural marvel are located in Liberty Park. Widely known for its sublime sandstone ledges, which ascend nearly seventy feet skyward at some points as they pass by small caves, the Ledges are like nothing else in Summit County. In 2011 Ledges Trail opened–offering visitors a scenic 1.1 mile hike, with lovely ferns, lichen and other natural ephemeral in full-view. It is also a popular destination for birding. 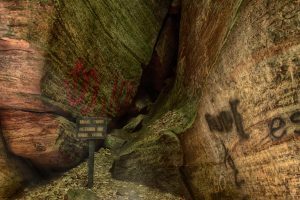 Unfortunately some graffiti has appeared over the years, but for the most part the Ledges look very much as they did 100 years ago. 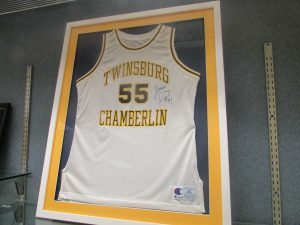 No organization binds the three communities and their businesses together more than the Twinsburg Chamber of Commerce. Founded in 1921 with a mere dozen members, the organization has steadily grown and now boasts over 260, according to Abby Fechter, executive director of the Chamber. There are approximately four hundred businesses in Twinsburg, the Township, and Reminderville, with over half belonging to the Chamber of Commerce (there are more than 260 active members as of 2018). Though the main focus is on businesses located in the three communities and on drawing new industry to those areas, the Twinsburg Chamber of Commerce also serves businesses in neighboring cities such as Shaker Heights and Hudson. The Chamber’s mission is “to promote the interests of its members, strengthen the local economy and advance educational, tourism and community development programs that contribute to making the Greater Twinsburg area a better place to work, visit and live.” Educational programming is determined by the member’s needs and wants. When the Patient Protection and Affordable Care Act was passed, members asked for and received a program on how the new plan would affect their business and their employees. Programming is tailored toward different types of businesses to assure every company is accommodated. From the outset of Kahle’s reign: “VMS strived to be on the leading edge in technology by acquiring the most modern equipment in their industry, and emphasizing the best in customer service.” In 2005 Kahle retired for good, handing over the reins of the company to his progeny, Dolf Kahle (who been appointed President in 1992). The company is currently one of the leaders in the customized digital, screen and large format commercial printing industry. One of Twinsburg’s more unique sports fads in the middle of the twentieth century was croquet. The elite of Twinsburg met and played often at the Alling Croquet Club. Led by Dr. R.B. Chamberlin the club was state of the art for its time and even featured a lighted scoreboard. The matches continued after Dr. Chamberlin’s passing in 1955, the only difference being they were conducted with a bronze plaque honoring Dr. Chamberlin present in the southeast corner of the club. The sport gained such popularity in Twinsburg that the Bulletin printed tournament scores on the front page of the newspaper in the mid 1950s. Possibly the most unique sports story in the annals of Twinsburg history involved one of the more successful athletes to ever reside in the region, Jim Mathis. Amazingly, his many athletic achievements occurred after injuring his spine, leaving him paralyzed from the waist down, at the age of 16. His rehabilitation took almost three years, but it wasn’t too long before he started the Cleveland Comets, who became a member of the National Wheelchair Basketball Association. With that he found himself competing against teams from New York City to St. Louis, but basketball was not to be his most successful sport. He was in New York City in 1957 when the first Wheelchair Track and Field Games were held in the United States, and decided as somewhat of a lark that he might as well compete in some of the events. Incredibly he won an archery competition, repeating his victory in 1958 and 1959. And while he finished second in 1960 it qualified him for the 1960 Wheelchair Games held in Rome. It was the first time the Wheelchair Games were held following the Summer Olympics in the same city. Mathis won the silver medal in Archery at the Rome Olympics, and considers it the most exciting athletic achievement in his career, according to an article he wrote for the Twinsburg Bulletin in 1972. 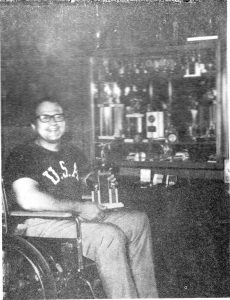 Noted Wheelchair Athlete in front of his Trophy Cabinet in 1972. During the 1964 games in Tokyo, Mathias won both a gold and silver medal in the archery competition. Mathis, who was living in Twinsburg at the time, finished 3rd in the 1972 National Competition and qualified for the U.S. Wheelchair Olympic Team for a 3rd time. Mathis, who at the time was also giving archery exhibitions in Twinsburg, had the region clearly in his corner when he left for the Olympics. He found himself on the front page of the Bulletin a few times that summer. Mathis traveled to Heidelberg, Germany to compete in the Wheelchair Olympics, which occurred few weeks before the 1972 Summer Olympics in Munich. For the first time he didn’t medal. It was his last Olympics, although by that time he had won three Olympics Medals as well as being a national archery champion four times, having competed in all 16 competitions up to that point. The pride of Twinsburg High School athletics is the girls’ basketball program. From 2011 to 2013 the Lady Tigers parlayed hard work, determination, and great skill into a mini-dynasty, reaching the Division I state finals, three years in a row, and winning the championship on their first two trips. It was a total team effort that carried the Lady Tigers to three straight finals, but there were two stars who shined brighter than the rest. Malina Howard, who had been receiving national attention since junior high for her hardwood prowess, was the undisputed leader of those championship squads. The six-foot-four basketball dynamo dominated the post in two straight state tourneys, rendering opposing post players defenseless, and sometimes offense-less. In 2012, the same year she led the Tigers to their second consecutive state title, Howard was named Plain Dealer Girls Basketball Player, also for the second straight season. Howard went on to become an Academic All-American at the University of Maryland. The other star was guard, Ashley Morrissette, who fully blossomed in her senior year, when she was named Ohio’s Ms. Basketball while leading the Lady Tigers to their third straight state final. After graduating from Twinsburg High School, Morissette moved on to Purdue University. In her senior season as a Purdue Boilermaker, she leads the team with over fifteen points per game. Possibly the greatest, or at least the most successful, athlete to ever emerge from Twinsburg is James Posey. He attended Twinsburg Chamberlin High School and was named the Division II high school basketball player of the year as a senior, in 1995. Aptly capable of playing all five positions, the versatile six-foot-eight senior averaged 24.5 points and 12 rebounds per game. After graduating from Chamberlin, he went on to star at Xavier University. He ranks sixteenth in scoring and tenth in rebounding in the history of Xavier Musketeers basketball. His collegiate success lead to the Denver Nuggets of the National Basketball Association selecting him with the eighteenth pick of the NBA draft. In the NBA, he excelled as a defensive stopper and clutch shooter for numerous teams over the course of his twelve-year career. Twice he was a crucial member of championship winning teams, first with the Miami Heat in 2006 and two years later with the Boston Celtics. Today, he is an assistant coach for the NBA champion Cleveland Cavaliers. Glenn R. Osborn, the first police chief in Twinsburg, is reported to have said: “It has always been my firm conviction that there is no more certain barrier to crime than efficient local policing supported by an enlightened, cooperative citizenry. Community respect and assistance are so vital to the success of law enforcement [and] are achieved only through unified police and public effort.” One need look no further than the three communities to find the truth in this statement. Prior to splitting into three separate entities, the three communities were policed by the Twinsburg Township constables. Twinsburg in the early years of policing has been compared to Andy Griffith’s Mayberry. It was a rural farm town where almost everyone knew everyone else and crime was a rarity. 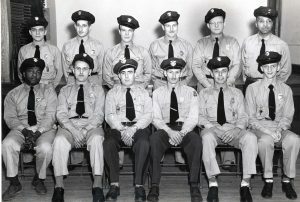 Twinsburg Constable force in the early 1950s before the Village and Township split. 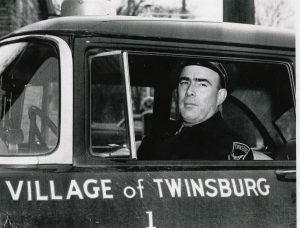 When the City of Twinsburg split from the Township and started its own police department on March 4, 1955, Glenn R. Osborn was named police chief for the newly formed Twinsburg Police Department. 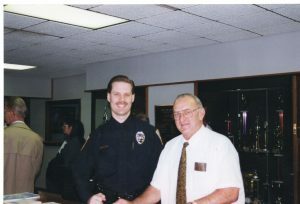 Osborn and patrolman Otto Clarvat were the first two full-time officers for the Twinsburg PD. In the beginning, Osborn’s wife was in charge of all dispatches for the PD and volunteer fire department. She did this from the Osborns’ house with the use of five telephones. Osborn was progressive in his approach to policing. Current police chief Chris Noga, who also acts as unofficial Twinsburg PD historian, has commented, “He embraced the concept of the police radio and brought those in. He was one of the first users of the police computer, that system where we can query and find out information on license plates, and driver’s licenses . . . does this person have a warrant out for their arrest.” He also served as the president of the Ohio Association of Chiefs of Police. Possibly his most important contribution was lobbying for the pension system for police officers and firefighters that now greatly benefits those who serve. Osborne sitting in police cruiser. Reminderville also would form its own police department, but until recently it lacked many of the advantages afforded the Twinsburg PD. When current Reminderville mayor Sam Alonso first took office, he recalls, village police officers were making well under ten dollars an hour. A number of the officers were enrolled in the WIC (Women, Infants, and Children) program to feed their families. The police station was a small backroom at City Hall, barely sufficient as an office for one more person, much less a police station. Presently police officers are making over twenty dollars an hour due to the efforts of Mayor Alonso. A new police station was funded by money procured from a major drug bust. The new station is located less than half a mile away from City Hall on Glenwood Boulevard. During a meeting on September 12, 1983, the Board of Trustees decided Twinsburg Township would start its own police department. Previously there had been talks with Reminderville about forming a joint police force, but no agreement could be reached. The Township police department officially came into being a mere nineteen days later, on October 1. Prior to the formation of the police force, the Township contracted with Reminderville for all its law enforcement needs. Four officers, including the chief, comprised the entire department when formed in 1983. Additionally, two patrol cars (purchased at a cost of $5,200 each) were procured, as well as equipment including radios, cameras, and an assortment of other necessities. In spite of these investments, the department did not last long. In January 1988 the trustees voted to disband it due to a slew of indiscretions combined with financial woes. Corruption was corroding the unit to the core, commencing at the top with Chief Samuel Williams. The discredited chief, who had resigned the previous year for “health reasons,” was charged on one count of theft and tampering with records, as was Sergeant. Demetrius MacKannon. The allegations mainly revolved around the chief and sergeant “double-dipping” by working on security jobs while still on the clock for the police department. Just as instrumental in the downfall of the department were the financial difficulties the Township was dealing with. Paying the sheriff’s department for five full-time deputies to patrol the area saved the Township almost $150,000 in the first year ($237,000 as opposed to the $377,000 it cost to run the police department). The THS has a substantial collection of papers, photographs, maps, books, and various vital artifacts pertaining to local history. They are also responsible for staging events such as the Olde Thyme Faire, at which youngsters can view how their forefathers lived and actively participate in an outmoded way of life as well. The structure that is now the THS building was built in 1865 by the Reverend Samuel Bissell, almost exclusively with his own hands. The Bissell Institute, established and run by the Reverend Bissell until his death in 1896, was housed in this building. In the course of his tenure more than six thousand students received an education, regardless of their ability to pay. In 1920 the Twinsburg Grange purchased the building, retaining ownership until 1963, when it was sold to the THS. The second story was removed when the building started to settle, rendering it unsafe due to the weight of the stones. The building is on the National Register of Historic Places. The Township is governed by a three-member board of trustees. Along with the three board members, there is also a fiscal officer; all four government officials are voted in by the Township populace. Board members are elected in November of oddnumbered years to a four-year term beginning on the following January 1. One board member is elected the year before the presidential election, as is the fiscal officer, and the other two board members are elected the year before it. The fiscal officer, known as a clerk prior to December of 2005, serves a four-year term. As of 2016, the board was composed of chairman Thomas O. Schmidt and members Jamey DeFabio and James C. Balogh, and the fiscal officer was Tania Johnson. According to the Township website, “the Board of Trustees appoints all Township employees each year and approves all Township contracts and purchases, except where such authority is officially delegated. … The Township Manager oversees the daily operation of the Township, including management of all Township employees.” The current Township Manager is Robert S. Kagler. Twinsburg Township was organized by proclamation of the Portage County Commissioners in April 1819. The first recorded public official was clerk Frederick W. Stanley. The first known trustees were James Roach, Hanford White, and Lyman Chamberlin. There is a another community (besides the Township, city, and village) with a rich if too often unspoken history: Twinsburg Heights. It is often referred to as simply “the hill” by its residents due to it being situated atop a hill. Though officially part of the Township it has always been something of an entity onto its own. It has since its inception been unincorporated. The small development spans all of seven streets, all of which are named after venerable universities—Oxford, Yale, etc. It lies all along and to the west of Hadden Road (previously know as Richner Road) between Darrow and Highland roads. An unusually close-knit and religious community, all the residents were familiar with one another and there was a church nestled on every street. There has always been a sense of family among the residents. Tania Johnson, Fiscal Officer for the Township and life-long resident of the Heights recalled, “even if you weren’t related…you felt like you were related.” Block parties, numerous church and social clubs, and the beloved community center were factors adding to the closeness felt by the residents. Brady promised a church site to the first pastor to move to the Heights. This was eventually awarded to Reverend John W. Ribbins, who moved from to Cleveland to the Heights.  The site for the new church was 2089 Oxford Street at the corners of Oxford and Yale. The first church meetings in the Heights “ were held in a room rented from Emman Mckinney, and a little later the home of Lewis McDonald served as a meeting place,” according to a History of Twinsburg. May 25, 1932 is the date the church was officially organized with Rev. J. B. Wilder serving as Chairman and Christine Golden acting as secretary. They moved from parishioners homes to Church of God in Christ, located on Eaton St. in 1933. In late 1934 the congregation moved again, this time to the new church built on Oxford Street, with Rev. Ribbins serving as the first pastor. At this time the church was named Mt. Olive Baptist Church, still active today and the longest running church in the Heights. It was the first of many churches in the community. Some of the other houses of worship that were founded in the Heights included the African Episcopal Methodist Church, the Sanctuary of Praise, Seventh Day Adventist, Apostolic Church of Christ, and other non-denominational churches. From the 1940’s, a Mt. Olive Sunday school class. Though the Heights has been considered a great place to reside by nearly all current and former residents, it has seen its share of injustice. Residents of the Heights have often been the beneficiaries of racism and discrimination. The Heights was never able to establish equality with or independence from the Township or the City. If the Heights had been incorporated into a village in the 1960s as was attempted, greatly needed improvements and renovations the community greatly need would have occurred much sooner. Incorporation was always blocked by Township Trustees. In the mid-80s The Plain Dealer ran an article citing numerous instances of African-American residents of the Heights being the victims of the discrimination. Incidents ranged from school bus drivers refusing to pick up or drop off students in the Heights to police profiling. There was also a rash of fires set to houses and other properties in the Heights. One of the greatest injustices dealt to the residents of the Heights was the lack of running water and even electricity in many homes. Running water, a given for most Americans by the middle of the Twentieth Century, yet wasn’t commonplace in the Heights until the 1980s. Gas and water lines “came down Hadden, went up Cambridge all the way to Chrysler…but we were not allowed to tap in,” according to Carol Tate. Besides the water line originating in Akron that pumped water to the Chrysler Plant there was also a water line from Cleveland to the village of Twinsburg. Though both lines passed through the Heights, residents of the impoverished community were not allowed to tap into either. Well into the latter decades of the twentieth century, paved roads were an unknown commodity. “Sometimes the roads were so bad that the bus couldn’t go any further than Hadden Road, so we had to walk from our home to Hadden Road, at least a 10-12 minute walk when conditions are favorable. Sometimes the mud would be over our shoes,” said Ms. Tate. Street lights were uncommon as well. Starting in 1980s a revitalization program happened in the Heights. Finally running water, electricity, sidewalks and paved roads became the norm. Modern homes have been built. It was a long process and immensely overdue. The Heights has been on the upswing for years, but the difficult times should not be forgotten. Filmmaker Carla Carter, along with a group of high school students, brought the story of Twinsburg Heights to the masses with the documentary, Voices on the Hill. The film has played at a number of film festivals across the country. The potential for a storm to spawn a tornado peaks during the heat of summer. Mother Nature decided to mix things up, however, when Ohio was rocked by an unusually late tornadic outbreak on November 10, 2002. News stations around the state had their hands full as nineteen tornadoes touched down across the region. One left a scar on the land and lives of area residents when damage and destruction from a swirling storm damaged dozens of homes and completely leveled others. A small F0/F1 tornado touched down in Macedonia near the intersection of Valley View Drive (SR 631) and Aurora Road and moved northeast. The tornado gradually strengthened and reached F2 intensity as it crossed State Route 14 and moved into Twinsburg. Extensive damage was done in Macedonia and Twinsburg. In Macedonia, 60 homes were damaged including two that were destroyed and 15 others were damaged enough to be declared uninhabitable. The most severe damage in the county occurred in the Glenwood Preserve neighborhood on the north side of Twinsburg. Extensive damage was done on Andover Drive and Deeplake Circle where several homes were leveled and a total of 45 homes damaged. Damage estimates in Twinsburg alone were well over $5 million. The damage path was continuous and about 100 yards in width. Dozens of cars were damaged or destroyed and hundreds of trees and power poles downed in Summit County. During the Thanksgiving Blizzard of 1950, forty-mile-per-hour winds socked the region, and a blanket of snow more than one foot deep covered the land. Areas farther east fared worse, with some Ohioans recording more than two feet. The culprit was an extratropical cyclone that paralyzed the area unlike any storm during the prior three decades. Temperatures hung near zero, freezing water lines and killing car batteries. Nationally, 353 souls perished due to the storm. 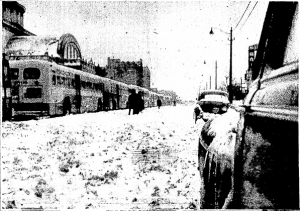 Many sources compare the storm’s ferocity to that of the 1913 storm that crippled the region for five days. Estimates place fatalities for that storm at over 250. In Cleveland, the Ohio National Guard provided support in light of the countless police officers unable to make it in to work. Many of those enjoying family and festivities over the Thanksgiving holiday were forced to extend their stay.